This throw sized quilt is done in colours that I love and feel quite content to have in my home environment. It feels like a subdued Christmas quilt – one that I can use all year long. The centre part was in my stash for a long time before I became determined to finish it. I added the borders during a quilt retreat in October, then quilted it in November. I hand stitched the binding beside the fireplace during a cold winter weekend at the cottage. Now, another finished project! Hooray! Here is another cozy quilt which I finished hand quilting during the summer of 2017. it sure feels good to have these projects finished and off my To Do list. This quilt had been languishing in the half-done pile for a long time. Once I got at it, it did not take too much time to finish up the last two rows of blocks. Because it has both flannel fabric on top and flannel fabric as backing it is really soft and cozy. The batting, a thin cotton batting adds to the old-fashioned feel of the quilt. Flannel does not hold its shape as well as regular quilting fabrics, but it is definitely a snuggle quilt. I quite like the feel and warmth of this lovely little quilt. 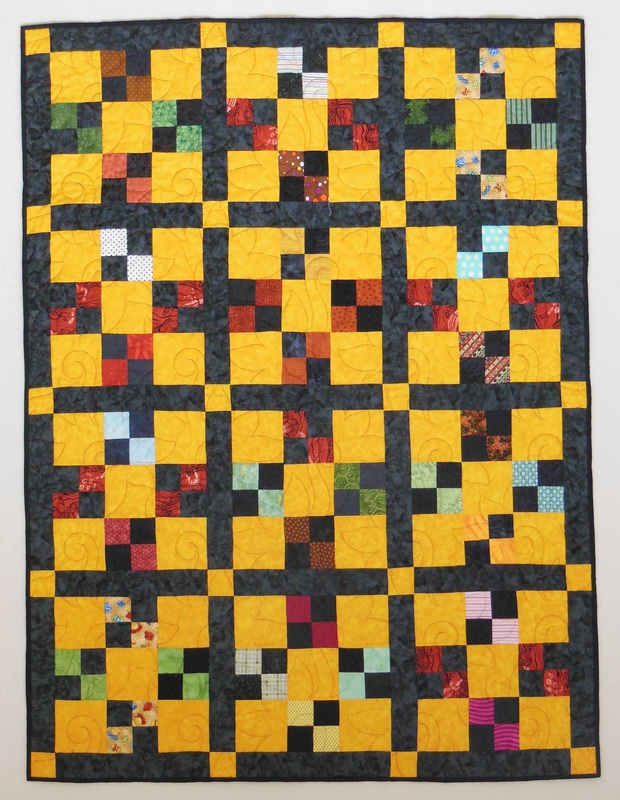 This afghan sized quilt uses a poker themed fabric in the stack and whack blocks. These are made from fabric I bought at the members boutique of the Mississippi Valley Quilters Guild in Davenport Iowa. I set those blocks with a plain back setting triangles. The narrow yellow stop border and poker print inner border contain the spinning triangles. 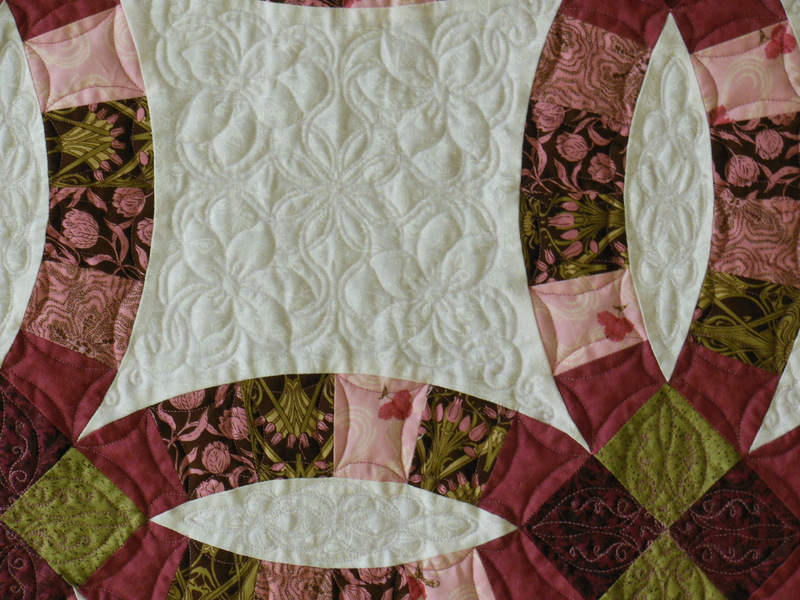 The solid black outer border gives a nice canvas to show the motion in the quilting design. The digital design is “Bounce” by Ann Bright. The quilt is bound with a blue and red watery fabric that picks up the colours of the pinwheels. I’m sure a card player will love this quilt. This quilt was inspired by the center panel which I purchased at the quilt show of the Mississippi Valley Quilters Guild in Davenport, Iowa. Sometimes you need a simple project and this was definitely it! I pulled the small green checked inner border and Christmas ribbon weave print outer border fabrics from my stash. It was backed with a fun novelty Santa print and quilted with a Christmas Lights design by Deb Giessler. The hand stitched tonal red binding finished it off nicely. This quilt makes a wonderful Christmas Sofa Throw. It was selected by my niece Jaime and her husband Travis as their wedding quilt. This Stack and Whack quilt was made from a UFO I purchased at the Mississippi Valley Quilters Guild show in Davenport, Iowa. The guild had a great show and a wonderful sale area. I spent too much money there! This package contained the stack and whack pieces cut out, the navy background pieces and enough of the Zodiac themed yardage for the borders and binding. I added the setting triangle fabric from my stash and bought the wheat coloured inner border to coordinate. This was the first quilt I assembled on my new featherweight machine. It was very pleasant to piece this – a project I did in small snippets of time during a small quilting class with advanced level children. When they did not need me, I just stitched away on my project and they stitched away on theirs. It was very companionable and gave me something to do rather than stand over them when they were fully capable of sewing on their own. Once the top was pieced, I quilted it with a design called Just Stars, which enhanced the Astrological theme of the fabric and echoed the stars of the setting triangles. The thread is a gold Omni by Superior Threads. The finished quilt was given to Adam and Meg as a wedding quilt. Adam is a neighbour at our cottage who played in the forest, swam, boated, skiied and eventually partied every summer with our two children. He is the first of the very tight knit group of seven cottage kids to get married. He chose a lovely life partner and we were happy for them both. 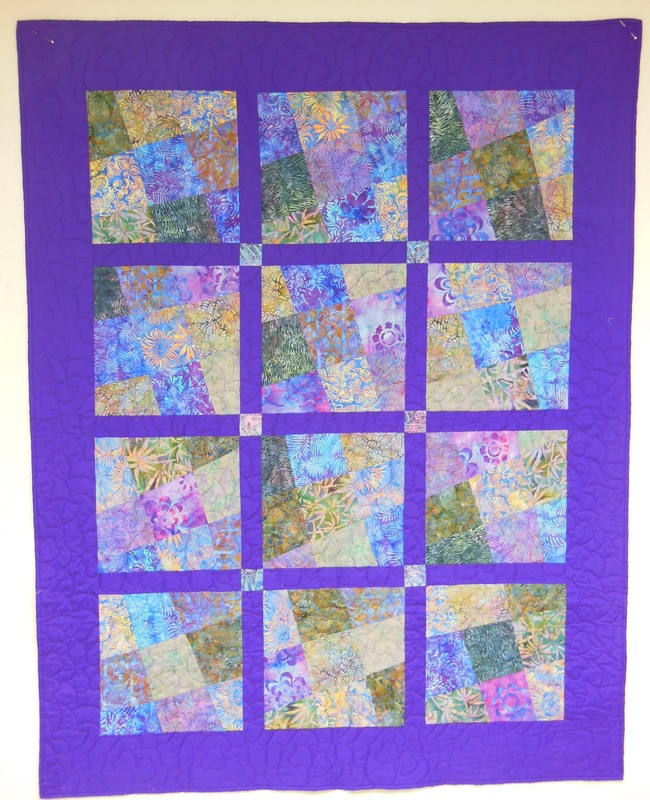 This quilt”Batik on Angle” was made of orphan blocks donated by guild member Leslie. I pulled the coordinating fabrics from the stash, figured out the layout and sent it to guild member Adriana to assemble. It came back as a top and I quilted it with Keryn Emmerson’s Bramble panto. Then guild member Annie added the label and binding. Last November, when guild member Diane suddenly passed away, our guild received many of her UFOs. 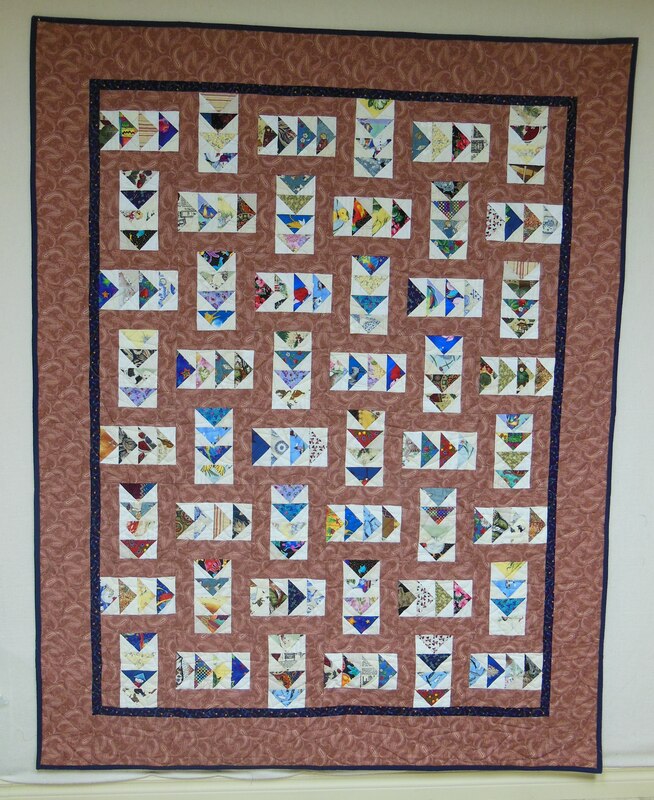 This quilt came from a stack of carefully pieced flying geese. Someone else donated a large length of the brown fabric. I designed the block and made a sample. Using my Accuquilt cutter, I cut the brown strips to complete the blocks and guild member Ruth assembled the inner section of the quilt. When it came back, I added the borders and then quilted it. Guild member Nancy added the binding. It is being donated to the organization Women in Crisis. 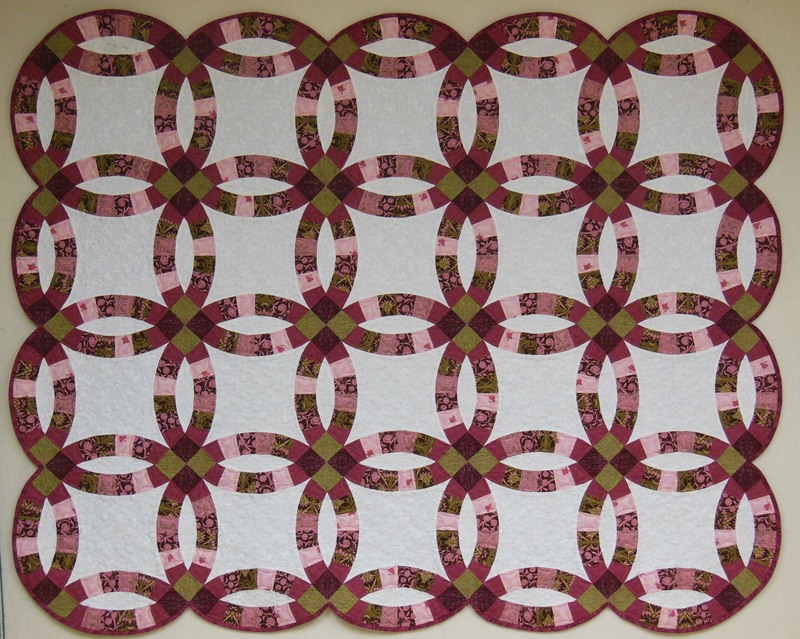 This top is made from a set of 4 patch blocks received when guild member Diane passed away. I dug in the stash, pulled the yellow and black and cut the pieces to make the rest of the kit. Guild member Phyllis assembled the top. 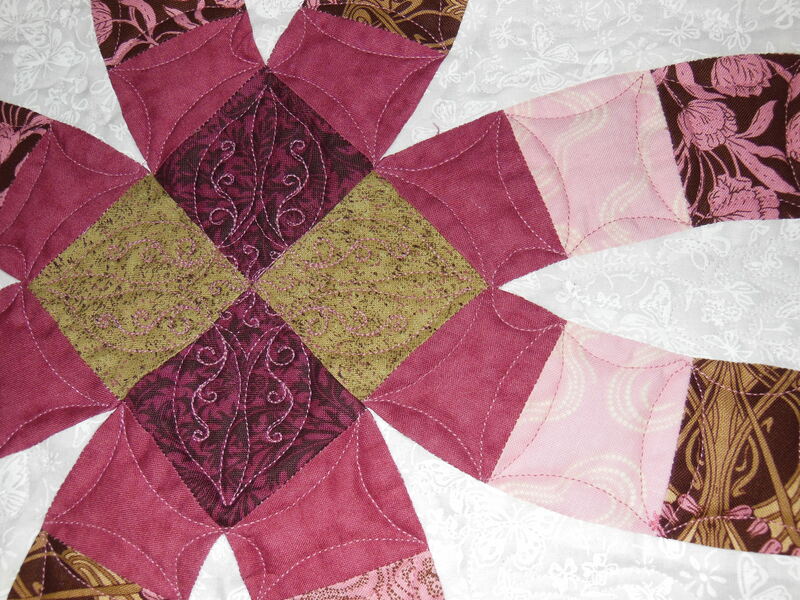 I quilted it and then guild member Annie added the binding. This quilt is being donated to Victim Services. Teamwork makes the projects go faster and generates many good memories!